Create A Collection Of Holiday Art Designs! When the Holiday season rolls up on us in full force, my fellow artists and the curious, do you have a collection of drawings or photos to pull design ideas from for window decorating? Create a sampler book using the traditional shapes and images from the holiday designs that are so dear to our hearts. My standard design theme over the past few seasons has been poinsettias and candles. These evolve year after year into wonderful adaptations. I am an artist with styles that are cartoon-like to semi realistic. I haven’t been properly schooled in the art terms, but I paint what I paint. There are moments I have scheduled my paint box for an appointment and I am not sure what it is I will be painting. Thankfully I have my standard design images. Created long ago when I started learning how to do these art projects I sat down and did dozens of pencil sketches. The window will inspire me to pull in and arrange these delightful images. When the design comes around and I am ready to sketch in the elements, there is usually a nice giggle involved with it. Sometimes there is an inside joke. Mostly they are a testimony of how beautiful this time of year is. My 2012 Christmas Poinsettias are shown here. 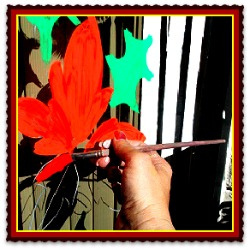 I chose fluorescent tempera paints to create a vivid image with the flower petals of this poinsettia. The brush strokes add the touches I needed to give it shape and form. With this design there is no need to do anything more but outline it. Fluorescent colors can add some very nice touches for highlighting and blending in images that are round in contour. Use them to outline, too. Keeping in the tradition of the Holidays, try to stay as close to the basic colors as possible but be creative! For More See: So, You Want To Be A Holiday Window Painter? What is your favorite holiday decoration design? Having an assorted set of sketches is vital to creating your design and organize your portfolio. Setting your images on paper gives your window clients an idea of what you have to offer them in design choices. By having a complete set of images set on paper you also have a way to demonstrate your talent. Pre-draw images to use in the holiday theme you are working with. Compile a sketchbook for each of the major holidays. Detail the sketch for an idea of what the complete image will be when finished so you also have an idea of how you want the image to appear when you paint it. Create single sketch images out of elements you will use for the complete design. An example of Poinsettia and Candles design and Candy Cane w/ Bow is shown. With these single images, you can create a host of designs. A Christmas Wreath incorporates several holly leaves and a bow for a colorful decoration on a door top. Holly leaves can trim and decorate difficult window areas and accent your greeting scene. Create the sketches first, then add photos of your finished designs to create your portfolio!